There’s a magician virtually everyone knows named Merlin. He was a character during the time of King Arthur and his knights of the Round Table. 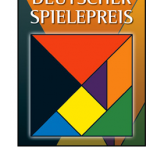 That’s the theme for the 2017 game designed by Stefan Feld called Merlin. Let’s take a look at how you play the game. Then I’ll tell you what I think of it. 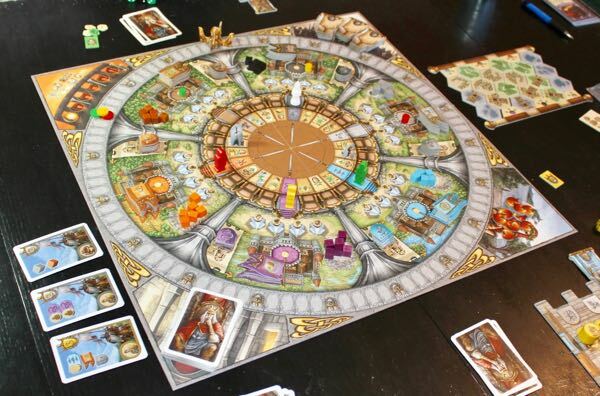 Below is a possible setup for a 3-player game of Merlin. As you can see, the board is very colorful and interesting to look at. The circular, gray ring is the scoring track. I goes from zero to 100 (both the same spot). In my 2 dozen or so plays to date, no one has come near the 100 point mark. I think the 70s (maybe the 80s once) is the highest anyone has achieved. Three of the four corners of the board are storage areas – for the bad dudes (traitors), apples, and cards. The fourth corner is for tracking the 6 rounds. It also has a handy, well-designed, scoring aid. Just inside the scoring track are 6 similar areas, each of a different color – black, gray, blue, purple, orange, and brown. Not the most exciting colors, but I think they were good choices since they are quite bold and since the player colors are red, (darker) blue, yellow, and green. The tan/brown circle inside those areas look like chairs situated around the center table. (Remember the theme.) It is these chairs where much of the action of the game takes place. You can see green, yellow, and red knights in their starting spots (stairs) in the picture above. Merlin, the taller white pawn is on his starting (always the black) stairway too. Just inside the ring of chairs are the actions associated with each chair. The six colored stairways are associated with the corresponding outer colored regions that each contain rule-breaking flags, defensive shields, building cubes, an influence tower, and spaces for players’ workers. 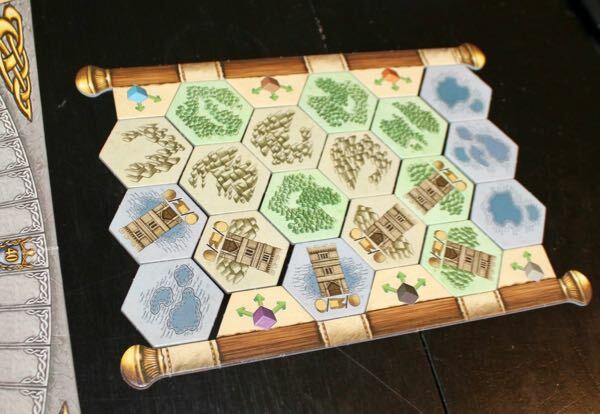 Off to the side is a building board made of randomly-placed hex tiles in three colors. The size of this board varies with the player count. This is an area control board that gives you points during each scoring round (after rounds 2, 4, and 6) and a one-time benefit if you place one of your buildings on a hex with a tower. If you do, you can either place an influence marker on any tower on the main board, take a flag, or take a shield (of any color). If you have the majority of buildings in a colored (blue, green, or tan) hex area, you get a point for each hex tile in that area. Each player has his own board for storing the bits he’ll use during the game. The board above shows a possible setup for the red player. Across the top are slots for the 3 traitors you try to defeat before a scoring occurs. If you fail, you get -3 points for each bad dude you fail to kill. (This is the only negative scoring in the game.) Traitors are randomly distributed, so you could receive pieces of the same color. For example, red has 2 gray dudes which he stacked in the same slot. Just below these slots are spaces for shields in colors matching the traitors. If you accumulate the matching colors needed, you can spend shields at scoring time to kill the bad guys. The left and right edges of the board have colored spots for storing flags. You can just see an orange flag at the lower right of the red board above. Spending a flag lets you break certain rules or get certain benefits. The orange one, for example, let you take the action on which another player’s knight rests instead of the action where your knight landed. At the lower left of the player board are storage areas for cubes, apples, and influence barrels. You spend cubes to build buildings on the hex board mentioned earlier. You spend apples to change a die to any number you want. You place influence barrels on the towers of the main board to score points. Just above this storage area are your 4 large, circular workers. When your knight lands on a colored stairway, you can place one of your workers in the corresponding spot and take an associated action. Actions are taking a cube, a shield, or a flag, or placing an influence marker. The lower right section of the board shows Merlin himself. There is room for 3 of his staves. You can spend one of these to take a “Merlin action” twice. There is also a spot for Merlin’s die. Next to it are spots for 3 dice of your own color. The original game comes with wooden dice – 3 in each color plus a white Merlin die. I like heavier dice, so I replaced them as shown above. Unfortunately, I didn’t have 4 white dice, so some players (like red) use a black die for Merlin instead. It doesn’t change the game at all. By now you’ve probably figured out how to play much of the game. 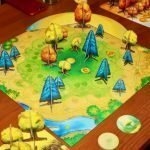 Here’s how to take a turn. 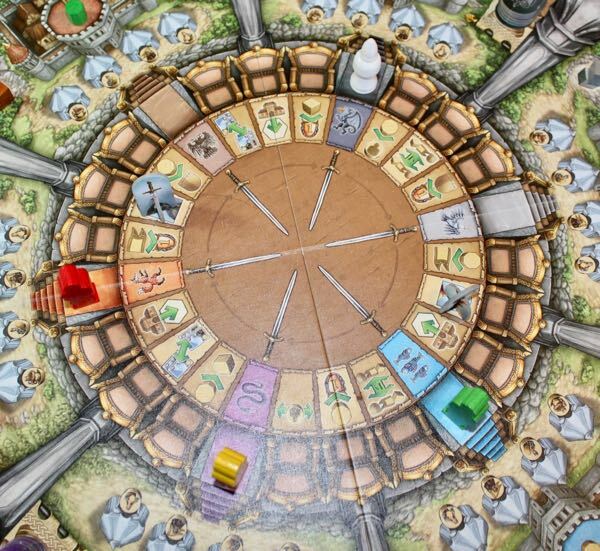 At the beginning of each of the 6 rounds of Merlin, all players (2 to 4) roll their dice simultaneously. If anyone rolls a triplet or 4-of-a-kind, he rerolls all his dice. You then store the dice on your player board as shown above. The starting player, who holds a cardboard, stand-up crown, places one die on the center table and move a knight or Merlin accordingly. Placing the die in the center simply shows it’s been used. If you use one of your 3 colored dice, you move your knight clockwise around the circle of chairs and stairs. If you use your Merlin die, you move the white pawn in either direction! You then take the associated action for the space you land on. If you land on colored stairs, you place one of your 4 workers on the board in the corresponding spot and take its action as described earlier. If you land on a chair, you take the action as shown below. The various actions include building buildings on the hexes, getting points immediately for items you currently possess, performing an action in a colored section where you have at least one influence barrel, exchanging bits, exchanging cards (more on those coming up), and moving a worker to an adjacent colored area. There are two other special spots: Excalibur and the Grail. If you land on Excalibur, you immediately kill a bad dude. If you land on the Grail, you gain an apple. You have a hand of 4 cards from the start. At any time during your turn, if you have fulfilled the requirements shown, you can cash one in for the points (1, 2, or 3) it gives. Then you draw a new card from the 3 shown or from the draw pile. 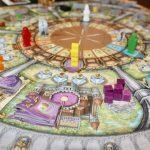 Merlin is one of the best Stefan Feld games I’ve played. It ranks right up there with Trajan and the Castles of Burgundy. Each turn, you always have plenty of options. Sometimes they’re almost overwhelming, but that just adds to the fun. It’s a lot better than having too few or no options. If you have trouble with analysis paralysis, you may take a long time on your first turn or two each round. Rarely will you not be able to kill all 3 bad guys within the two rounds before scoring. Even if you can’t one time, it’s not that bad. Three points is a lot in Merlin, but the negative is not insurmountable. 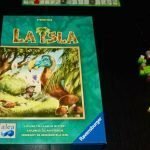 There is an expansion that comes with the basic game. I’ve only tried it once. I would use it again, if the other players were willing. It extends the usefulness of the cards, giving you additional bonuses or actions on an addition player board. 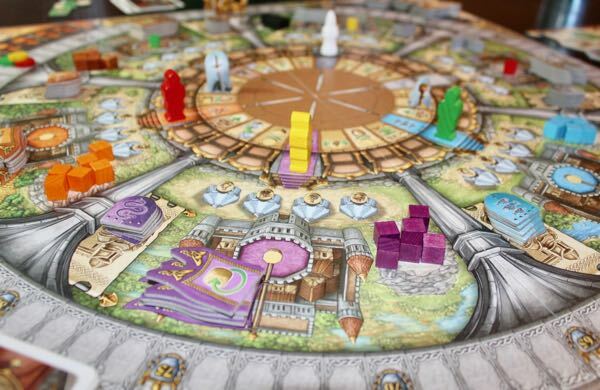 So Merlin is a beautiful game that’s lot of fun to play. As is usual with a Feldian game, you get points for just about everything you do. There are quite a few rules, but I wouldn’t shy away from teaching this one to someone unfamiliar with this style of game. It’s not exactly a “gateway” game, but it’s close because everything is easy to understand. Check the pricing of Merlin at Amazon now! 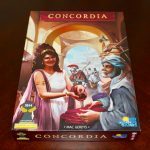 Concordia Review: Can We All Just Get Along? Or Not? Need a great website host? Check out SiteGround today. Copyright © 2019 Fun Board Games. Powered by WordPress. Theme: Spacious by ThemeGrill.